Our Little Miracles: Happy Birthday Granny P! Our Granny P's birthday was last week. We went to a party for her on Sunday. We got to see alot of family and the boys had so much fun! We love you Granny P!! 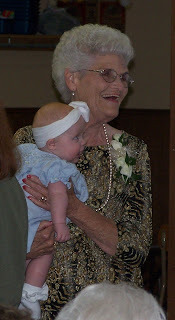 Here is Granny P and Gracie - who we got to meet for the first time. Gracie really seemed to like the boys! 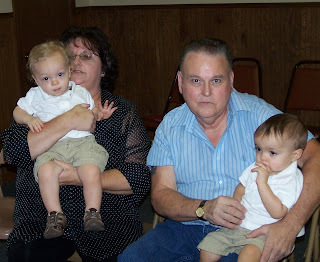 Here are the boys with Gran and Uncle Charles. 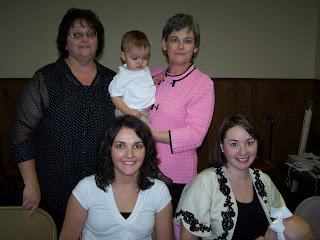 Here is Carson with me, Gran, Auntie Adele, Cousin Marissa, and Cousin Gracie (she was hiding in Marissa's lap). Hayden was too busy playing :).